Second Mile, infant mortality, and gun rights for felons: This week’s top Muckreads from ProPublica. Pennsylvania Gov. 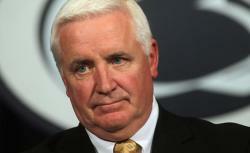 Tom Corbett approved a $3 million grant to Jerry Sandusky’s charity, the Second Mile. When Tom Corbett was Pennsylvania’s attorney general in 2008, he oversaw the beginning of the Jerry Sandusky investigation. Now governor, he approved a $3 million state grant to Sandusky’s charity,the Second Mile. The grant is now on hold. As local economies suffer, so do the chances of babies making it through the first year of their lives. The Milwaukee Journal-Sentinel notes that the U.S. has dropped in worldwide infant mortality rankings, with Milwaukee impacted especially hard. People with felony convictions forfeit their right to own guns, but thousands of felons each year, including those with violent histories, are finding those rights reinstated without even a hearing. The leniency varies based on the state. An army corporal earned two valor medals in three years in the military, but his life was falling apart otherwise, testing positive for cocaine. The Army moved to get him out of the service, and critics claim Fort Carson is increasingly using the policy against soldiers accused of minor misconduct. More than 100 countries have laws granting citizens a right to know what their governments are up to, but whether they follow through on them is an open question. The Associated Press found that only 14 responded in full to a sample request before their legal deadline. More than half didn’t respond, and three out of 10 didn’t even acknowledge the request.